A rainy breezy day, after two days of mostly sun and mild temperatures. Got very wet this morning taking the dogs for a walk in the woods. They got wet also, but didn’t seem to mind it. With the temperature in the mid-40’s and a warm (but not waterproof) jacket, I didn’t either. Dropped them off for their monthly bath, and went to a local nursery for some soil amendments for my vegetable garden, where I’d done substantial planting yesterday. And more to come. I need to find a bunch of earthworms who’d like to have a new home — there are few in my raised beds, and the soil gets too easily compacted. Worms would help a lot. Above is a close-up of a recent fabric I wove — it’s a mixed warp, with several different yarns randomly sleyed across the width, mostly hand-dyed rayon and cotton. 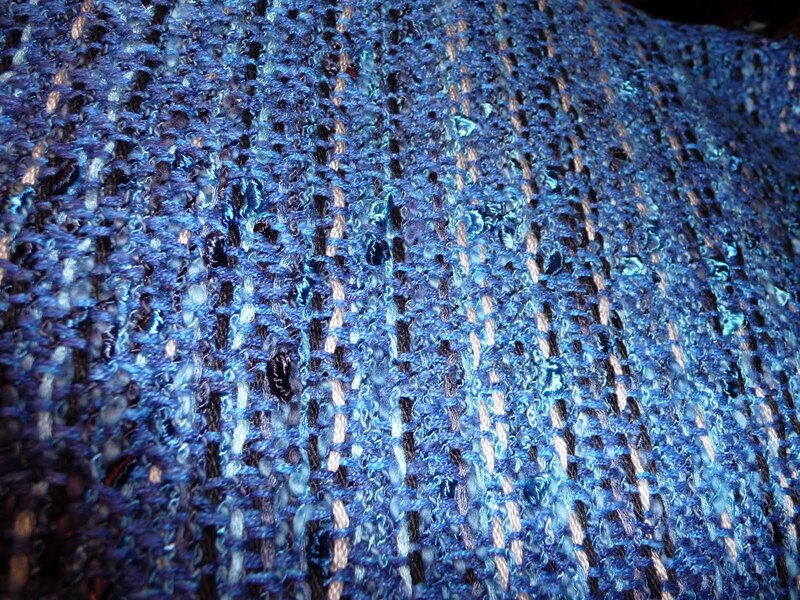 The weft is tencel, so the finished fabric is shimmery and drapes beautifully. 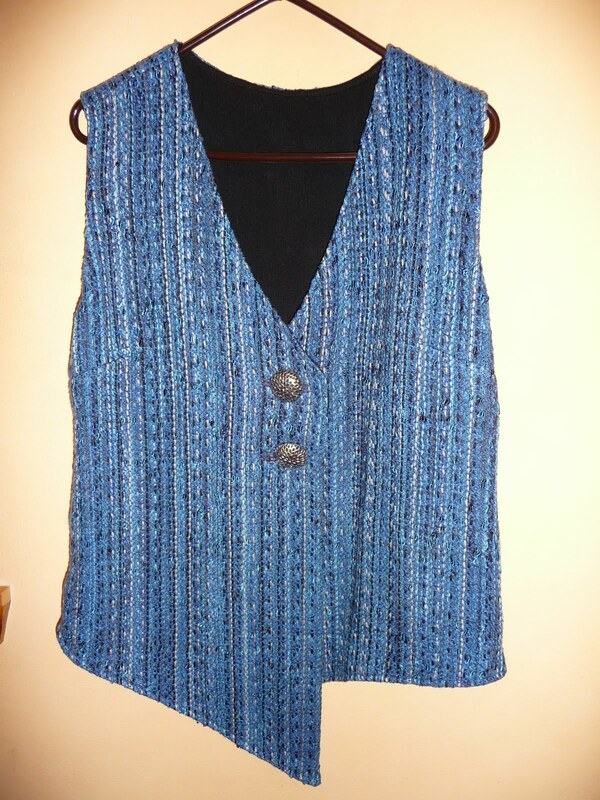 To the right is the vest which was made from it, with silver buttons and a black rayon lining. The woman who commissioned it was exceedingly pleased. 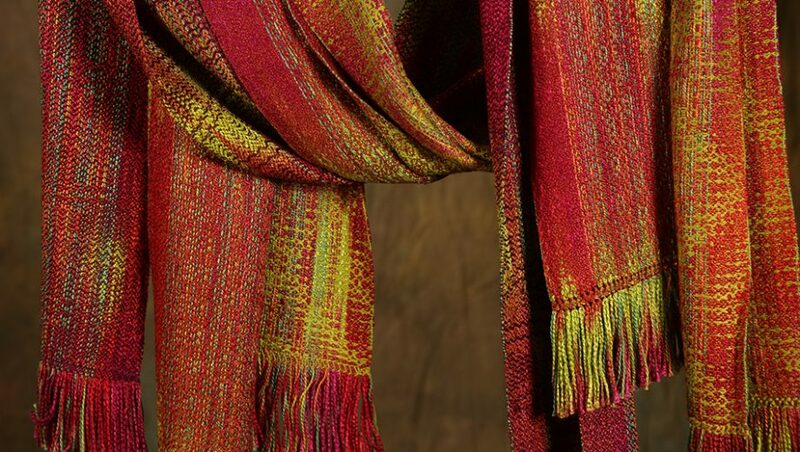 Today I’ve been weaving on the “Flame” warp — a run of four scarves on a hand-dyed rough silk warp, with elaborate patterning and a nice rough texture. The first two will be cut off this week so I can wash and iron them, then take them on Thursday to Raven Rocks Gallery north of me at Greenbank Farm. I’ll bring home a few items that have been there for several months, and begin to build up an inventory here in my studio/showroom for my expected summertime tourist visitors. Having two places where folks can find my work and try things on maximizes the possibility of sales. And people love coming into my workspace to see how it all happens.